hen you're an adult, fitting in can be exhausting. When you're a kid, it can be an absolute nightmare. That’s why a school designed to help students feel included from day one is expanding in Boulder. BOULDER, Colo. -- When you're an adult, fitting in can be exhausting. When you're a kid, it can be an absolute nightmare. That’s why a school designed to help students feel included from day one is expanding in Boulder. “Everybody has challenges, it’s just up to me to rise above them,” said Zach Swaim, a Senior at Temple Grandin School . For Swaim, challenges began for him at an early age. “I felt ostracized, I felt like an outcast, I felt like there was something wrong with me, something different about me and it was kind of a dark time,” said Swaim. By the time Swaim reached middle school, he needed more support as his mom watched him struggle with anxiety and depression. “At the end of that experience I had trouble getting him to go to school and I really thought I had a high school dropout on my hands,” said Jeanne Work Swaim, Zach’s mother. Swaim finally found answers when he was diagnosed with Asperger's syndrome at age 11. Two years ago, he began school at Temple Grandin, a place where differences are welcomed. “We are here to provide a supportive educational community for them to recognize and realize their potential,” said Jen Wilger, the Executive Director and Co-Founder of Temple Grandin. Wilger co-founded the school eight years ago after her son Micah was also diagnosed with Asperger's. 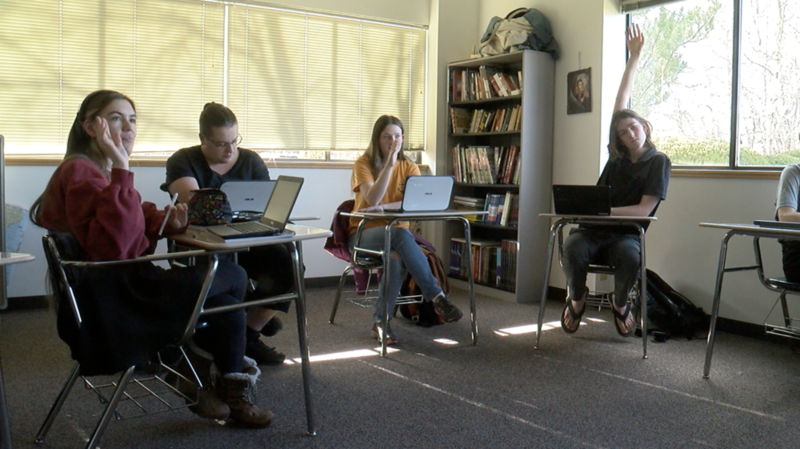 “We have grown from our starting size of eight students up to 20 or 25,” said Wilger. That growth moved their school from a house about a mile away, now into a larger building on Indian Rd. just a few months ago. “It’s all a community and that's something that I have always longed for,” said Swaim. As Swaim prepares to graduate and attend Colorado School of Mines in the fall, he's learned that his differences are something to be celebrated. “I wasn't even sure if I would get to this point and now I am here, and I am so ready to be the person I know I can be and reach the potential I have,” said Swaim. The school will welcome the public to the new location at 3131 Indian Road in Boulder on January 25 at an Open House Celebration from 3 to 5 p.m. Visitors can tour the campus with a current parent, meet teachers, and learn about the school’s socio-academic program. There will be a Community Room dedication and ribbon cutting at 3 p.m. School tours will take place from 3:15 p.m to 5 p.m.